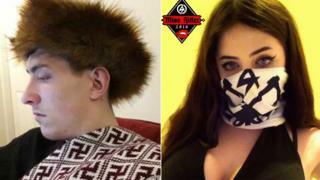 A "Miss Hitler" contest entrant sent a "kill, kill, kill" text to her boyfriend after talking about gassing people, a court heard. Alice Cutter, who is accused of being a member of banned group National Action, was texting her partner Mark Jones on June 22, 2016. The pair were discussing by text how to make lethal chlorine gas from household chemicals. She messaged Mr Jones: "Yes, yes, yes. Kill, kill, kill." Mr Jones was giving evidence at Birmingham Crown Court. Ms Cutter, 22, and Mr Jones, 24, both of Mulhalls Mill, Sowerby Bridge, near Halifax, West Yorkshire both deny being members of the organisation banned in December 2016. Ms Cutter, replying to Mr Jones, said: "So potentially, this stuff could be bottled, corked and thrown through someone's window to gas them to death?" Mr Jones told jurors the conversation about chlorine gas had been sparked by the products Ms Cutter had been using to "clean her bathroom". Mr Jones was an "admirer" of Hitler and had a gift edition of the Nazi leader's book Mein Kampf, he had previously told the jury. His girlfriend, Ms Cutter, had entered a "Miss Hitler" contest under the name "Buchenwald Princess" referencing the infamous Nazi concentration camp. Giving evidence, Mr Jones rated himself as "probably a seven", on a hypothetical chart of how fanatical a National Socialist supporter he was - with Hitler at 10. Mr Jones also said he posed for a photo with another man, both giving a Nazi-type salute, and with the National Action flag unfurled, inside the execution room at Buchenwald. The other man was group co-founder Alex Davies, Mr Jones told the jury. Mr Jones and Ms Cutter are on trial alongside Garry Jack, 23, of Heathland Avenue, Castle Bromwich, Birmingham, and Connor Scothern, 18, of Bagnall Avenue, Daybrook, Nottingham, who both deny the same charge.